What iGEM teams achieve in less than a year is incredible. The following examples demonstrate the hard work and true potential of teams. Grand Prize Undergraduate Section winners, Team Imperial, worked on developing a Genetically Engineered Artificial Ratio (GEAR) system to control population ratios in microbial consortia. Grand Prize Overergraduate Section winners, Team LMU-TUM_Munich, worked on creating a novel bioink that exploits the rapid and specific interaction of biotin and its tetrameric binding protein streptavidin. Grand Prize High School Section winners, Team HSiTAIWAN, worked to create a series of cheap, user-friendly E. coli biosensor that can detect the poison inside the Chinese Medicine by just examining the fluorescence intensity. iGEM is a truly international event with teams coming from all over the world. The United States, Canada, Chile, Pakistan, Japan, South Korea, Egypt, Bulgari, Mexico, Brazil, Germany, France, and Australia are only some of the countries that have participated in iGEM. The map below shows all the teams that have participated since 2004. You can also see the complete list of 2018 teams here. Teams will have to meet various deadlines and requirements throughout the season. You can see this year's calendar on our 2018 calendar page. Timelines are different for every project; however, in general teams begin to organize between December and January. They need to get faculty approval, recruit members, fundraise, and brainstorm project ideas. Between the start of February and the end of March, the teams will register (which includes paying the registration fee, providing a resource description, and providing contact information so teams can receive important emails from iGEM HQ and their DNA Distribution Kits) and, once they are approved by iGEM Headquarters, they will receive their DNA Distribution Kit sometime in April. Once the kits arrive, work in the lab will take place between May - August. During these months, teams will get together in regional meetup events, work outside the lab doing community outreach activities, and will document their efforts in their wikis. At the end of the summer, the Giant Jamboree will bring all of the teams together to share and celebrate their hard work. Many disciplines come together in iGEM. The competition might seem exclusive to biology or engineering disciplines, but teams will often have students from very diverse fields to complement the project. A few examples are: computer science, art and design, physics, marketing, law, mathematics and social sciences. Teams are also required to have two academic instructors in order to participate. This requirement helps ensure that teams have enough mentorship support throughout the competition. They are also encouraged to look for more advisors and mentors that can help the team succeed with their project. This often includes graduate students and other professors from their university who have experience with one (or more) aspect of their project. 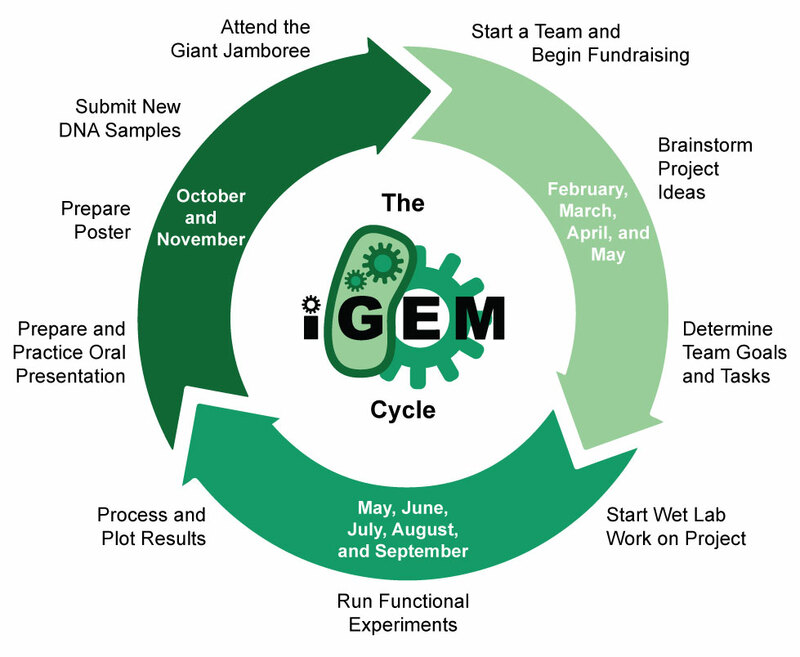 The purpose of the iGEM tracks is to help students focus their research projects. The subjects areas encompassed by the tracks aim to solve crucial global challenges; for examples, students have worked on projects related to environmental bioremediation, new medical delivery systems, and alternative energy sources using synthetic biology. Safety in iGEM is more than just maintaining standard lab practices and avoiding high risk organisms. iGEM teams follow a high standard of safe and responsible biological engineering. They are responsible for living up to the trust placed in them to design, build, and share biological devices safely. Teams must think carefully about the impact of their project, who will use it, who will benefit from it, and how will they safely dispose of it. While teams are responsible of complying to the safety rules of their labs and the biosafety standards of their countries, the iGEM safety program helped them by providing guidelines and offering resources and advice. Teams are encouraged to go beyond the bench. iGEM teams incorporate ethics, sustainability, social justice and education to their projects by reaching out to their communities, performing risk assessment and proposing new laws and regulations. Successful projects consider how to contribute to the world surrounding them. At the Giant Jamboree, iGEM teams competed for various awards. These awards range from Medals to Track Awards to Special Prizes. During the Awards Ceremony, the Undergraduate, Overgraduate, and High School teams presented their projects again to the entire iGEM community to compete for the Grand Prize. All of the medals, awards, and prizes were announced during the Awards Ceremony on Monday, which is the culmination of the Giant Jamboree. iGEM runs the Registry of Standard Biological Parts, which houses a growing collection of genetic parts that can be mixed and matched to build synthetic biology devices and systems. During the competition, iGEM teams have access to parts, samples, data, and tools to work on their synthetic biology projects. One of the expectations for participating iGEM teams is that they will submit any new biological parts they created to the Registry in order to help the Registry grow. Teams are also encouraged through the medal system to characterize their new parts along with existing parts from the Registry and submit that data to the Registry in order to help future teams use those parts.